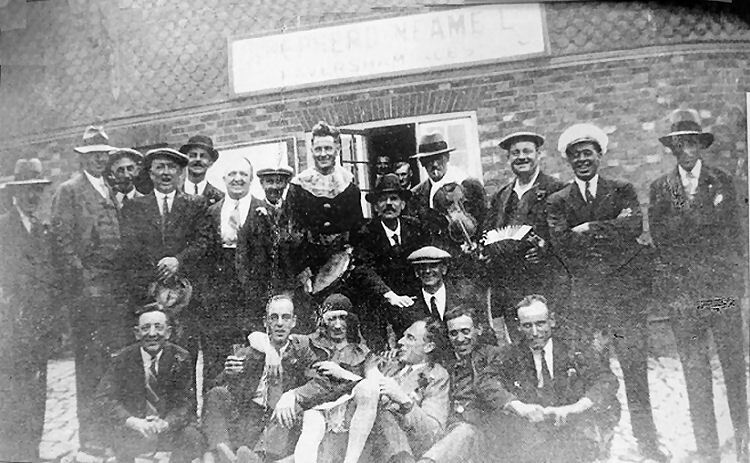 Another mystery from Rory Kehoe who says:- The picture shows the landlord and regulars of the "Cross Keys," Oaten Hill, Canterbury on a day out in 1928, visiting a Shepherd Neame pub. The notes on the back are vague: "somewhere in East Kent" which is not actually all that helpful. In shot but not specifically identified are: Richard Monk (licensee of the "Cross Keys" for at least 35 years), Chalky Smith, Joe Wright, Henry Ticehurst, William Everton, Pasha Baker, Chas "Chippy" Norton, Bill Cook, Wally Whiffen, Alf Hoskin and several members of the Small family. Sitting bottom right is Alec (later Sir Alec) Rose, who in 1967/68 sailed around the world single-handed. Alec Rose was born in Canterbury in 1908 and attended the Simon Langton Boys' Grammar School. Can anyone identify this pub though? The brickwork could help. Michael Mirams suggests this could well be the "Chequer" at Biddenden. Or perhaps the "George" or "Prince of Wales" at Cranbrook. Don't think the windows look right to me on any of them, so the jury is still out on this one. A further suggestion is that it could be the "George Inn" at Leeds.